While waiting for my father-in-law’s arrival from Kalibo (Aklan) at the NAIA 3 Terminal, I decided to kill time at the nearby Philippine Air Force Museum. I have visited this museum before, but only got to explore, with Jandy, the 16 “retired” planes and helicopters at the museum’s outdoor Aircraft Park. The indoor exhibit was just one hour to closing time during that visit. 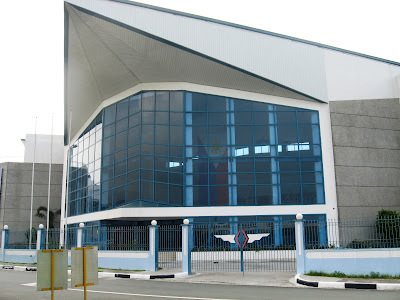 This military heritage and science technology museum was established way back on May 2, 1974 (as the Marcos Museum) but it only opened at its new location on July 1, 2001. The world-class museum building was inaugurated on June 29, 2007, the 60th foundation anniversary of the PAF. Surprisingly, this tidy, neat and quite impressive, 2-level museum, a good 2-hr. diversion for those who are also waiting for their plane connections, had a number of weekday visitors. The one on display is PT-13D “Kaydet” 76-7551 code 551 equipped with a 220-HP Lycoming R-680-17 radial engine (max. speed: 125 mph) and fitted with a ground-adjustable McCauley steel black propeller. The aircraft has a 32-ft., 2-in. wing span and is 24 ft. 10 in. long and 9 ft. 2 in. high. Also of World War II vintage is a propeller-driven P-51D “Mustang” fighter, manufactured by North American Aviation, the best fighter aircraft of World War II. Around 100 of these fast and maneuverable aircraft, with 6 wing-mounted guns, were delivered to country in 1952 and assigned to the 6th Tactical Fighter Squadron, 5th Fighter Wing in Basa Air Base (Floridablanca, Pampanga). Beside it is a modern, Italian-made SIAI Marchetti SF-260, a light military trainer with low wings and tricycle undercarriage that is still in use. The PAF acquired 2 variants in 1967 and initially received 2 SIAI Marchetti SF-260 operated by 102nd Training Squadron (now the PAF Flying School). The one on display had a tail number 15-44 and bore a tactical code 644. Aside from being used by the flying school, it is also used for counter-insurgency roles. Also on display are PAF experimental projects presented in ways to inspire young generations of Filipinos to learn on aerospace-related sciences. Of special interest is a prototype of the “Cali” Super Pinto, the first indigenous jet trainer and light attack aircraft in the country. This turbojet-propelled, mid-monoplane aircraft has a TEMCO model TT-1 Pinto air frame with 2-place tandem seating. Suspended on the ceiling is a locally-made, full scale model of the Wright Brothers’ 1902 glider and a U.S. space capsule. The Science and Technology Section also exhibits aircraft mock-ups and miniatures. There is also a souvenir shop on this floor. Also within this floor is a Dodge WC-57 Command Car (used by former Philippine presidents); armament and gun system of a Northrop F-5A; F-86F nose landing gear system; canopy and ejection seats (F-86F “Sabrejet,” F-4 “Phantom” and F-5A “Freedom Fighter”); a portable rescue hoist and jet engines. Kids may sit in the cockpit of an F-86D fighter jet simulator. The Heritage Section, at the second floor of the museum, presents a variety of galleries displaying different military uniforms and their evolution (Evolution of PAF Uniforms); flying gear; dioramas and sand tables of important events involving the Air Force (Dioramas/PAF Model Aircraft); model planes, memorabilia, vintage guns, locally made bombs; a display of things left by Japanese straggler Lt. Hiroo Onoda while hiding in the jungles of Lubang in Mindoro; and skilled drawings and paintings of early military aviation and PAF history. There are also photographs of past commanding generals of the Philippine Air Force; recipients of the Philippine Medal of Valor and Distinguished Conduct Star (Wall of Heroes); old photographs depicting the history of the Air Force and its Blue Diamonds aerobatics team (Birth of Philippine Aviation) and a photo exhibit of the historic May 29, 1936 Arnacal (short for the names of Filipino pilots Antonio Arnaiz and Juan Calvo) flight from Manila to Madrid (Spain). Philippine Air Force Aerospace Museum: Gozar cor. Alia St., Col. Jesus Villamor Air Base, Pasay City. Open Mondays to Fridays, 8 AM to 5 PM, Saturdays, 8 AM to 12 noon. Admission is free. Tel: (632) 832-3498, 854-6729 and 762-6628. This entry was posted in Metropolitan Manila, Museums, Philippines, Republic of the by Benjie Layug. Bookmark the permalink.